One of the other big announcements was that Google is offering vanity URLs within Google+ for virtually everyone. 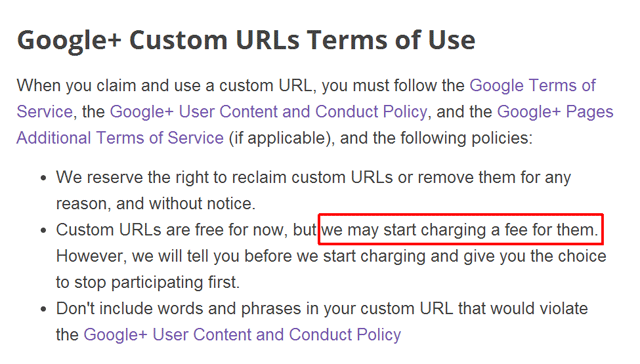 But if you read the terms of service, Google says for now these URLs are free, but Google may charge for them in the future. Does this mean Google will charge fees? Who knows, I can't imagine they will. But again, who knows. Google's John Mueller noticed the custom URLs work on all Google TLDs. So if I want to act proper, I can send people to google.co.uk/+BarrySchwartz. Custom URLs on Google+ was first introduced to a limited number of personalities and brands in August 2012. Forum discussion at Google+ at +OtavioSilva, +JanWillemBobbink and +JohnMueller and WebmasterWorld.